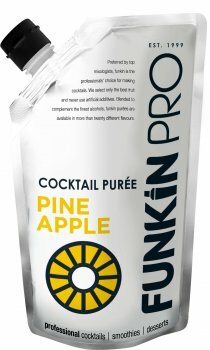 Funkin's pineapple is supersweet and juicy and combine Golden pineapple from Ghana with Cayenne pineapples from the Ivory Coast to deliver a fantastic tasting, sweet, fresh pineapple. Details: Pineapples from Ghana and the Ivory Coast, varieties Cayenne and Golden. Harvested in Poland and Spain, our strawberries have been the subject of much work by us at funkin. We have tried different too many varieties to count, and our chosen blend is a mixture of early season Honeoye, and then mid summer Elsanta and some late season Symphony, to create a fabulous best of season flavour. Funkin's Pineapple premium puree, used by the UK's top A-list style bars and chefs, and consisting of the finest globally sourced fruits.